Cotton production should be increased to 1.250 million tons next year in Turkmenistan, Trend reports with reference to the country’s Agriculture Ministry. This year, 550,000 hectares are allocated for cotton in the country, and a total of 1.050 million tons of raw material is planned to be harvested. It is planned to sow cotton seeds taking into account the soil and climatic conditions of the regions. 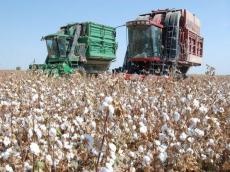 Government procurement prices for cotton were increased in Turkmenistan in 2019. The state will buy one ton of fine-fiber cotton varieties from citizens for 2,000 manats, medium-fiber varieties at 1,500 manats. For comparison, the previous prices were 1,650 and 1,144 manats respectively. Generally, cotton growing is one of the strategic agricultural branches of Turkmenistan. Currently, cotton-growing occupies an important place in the formation of the country's gross domestic product, the raw material supply of industrial sectors, creates a positive climate for the optimal solution of economic and social problems. Exporting cotton not in the form of raw materials, but in the form of the final finished consumer product can increase the profitability of the industry 18-fold. This is intended to contribute to the large-scale construction in the cotton producing etraps of our country of numerous cotton spinning, textile and sewing industries. The current industry production facilities allow for the establishment and effective implementation of deep industrial processing of more than half of the cotton produced in the country. Production figures for the industry show the annual growth achieved in the industry. If we talk about the prospects for the development of cotton growing in the country, The Mejlis (parliament) of the fifth convocation of Turkmenistan adopted the law “On cotton growing,” the Turkmen government said. The draft law defines the legal, economic, and organizational basis for cotton production in Turkmenistan and regulates relations connected with the turnover of raw cotton and cotton products. The adoption of this law will give a new impetus to the development of both cotton and a number of related industries.